I noticed that as a music teacher, it is always challenging to turn off my critiquing ears and mind when listening to live music, as it is my job on a daily basis to make constant assessments of the music I hear. Recently, one of my students was playing a piece and for the first time in a very long time, I got lost in her music making; enjoying her sounds, her ease of playing, her musicality, her confidence. When she was finished playing, I was totally unprepared to be the "teacher" I was supposed to be, as she left me feeling quite amazed and completely speechless. For the first time in a long time I was simply the "listener" getting lost in her music. After I collected my thoughts, told her about my goosebumps, the tears forming in my eyes, and the standing ovation she received from the hairs on my arms, she was beaming, just beaming with pride. She held her cheeks and said, "I am so happy right now!" This moment was such a beautiful moment for both her and I. This is why I teach, so I can be a part of creating these incredible moments with my students that will definitely last forever in our memories! The Thought of Practicing: Re-invented! Great blog post by Dr. Noa Kageyama posted on ﻿The Bulletproof Musician﻿ about coaxing yourself to practice. Getting yourself to practice can be a challenging endeavor, especially when you have a to-do list the size of China, or a tempting, but imaginary to-don't list. (Who writes to-don't lists, anyway? They kinda just happen). Read this article, and change the way you view practicing, forever! While many-a-musical moments have occurred here at the studio since it's inception, I have just decided to begin documenting them here on my blog. This will be a great way to share with you the awesomeness that happens at JMM, all while helping me remember these unforgettable moments! Student: Little X (4 years young). Super bright, loves superheroes, and is a tad bit nervous about performing in his first piano recital. During his lesson today we spent lots of time practicing performance and talking about his nervousness regarding his first ever piano recital. I shared my feelings as well, as I too can relate to having the case of the jitter bugs before a performance. This made him smile; I guess he felt that he wasn't alone. He played his piece, practiced, and bowed over and again until finally, lesson time was up. At sticker time, one of his stickers ripped. I told him that I am a Sticker Superhero and I will save his sticker. He said, "You're not a Sticker Superhero. You're a Performance Superhero. You help people who are scared to perform." I asked him if I helped him today and he said "Yes!" with a big smile on his face! I have now officially reached superhero status and "Yes!" it feels awesome! Nutella Cinnamon Cookies, Pumpkin Cream Cheese Pie, Blondie Brownies, oh my! I love, love, love to bake. It's one of my favorite things to do. What type of baker am I? Well, I would say that I'm a "follow the recipe" kind of baker. The purpose of a recipe is to guide you. To help you make good and tasty decisions, all while leaving the guesswork behind. Since the holidays are approaching, quite rapidly, might I add, I've been inspired to create a delectable recipe for my students that can be used all year round. This recipe will give you the mental and physical tools you need to begin to practice effectively, before you even play a note! Parents, please take these suggestions to mind when your child is practicing. Part of your role as a parent is to optimize your child's practice experience! For example: Practicing for 30 minutes? You need an hours worth of patience; this way, you'll never run out! Playing the piano makes you a bit of an athlete (and you can actually burn lots of calories doing it, too!) You must have both mental and physical endurance to effectively and efficiently practice. Choose your practice time to benefit your brain and your body, and your brain and your body will give you the results you are capable of achieving. It is always a teachers duty to have faith in you as our student; to give you the tools you need to not only learn effectively, but to believe in yourself. I am well aware, however, that learning an instrument is not easy and it can be tempting to be hard on yourself. Remember, you are studying music. When you study something, you are learning it. Learning is a process that is sometimes easy and sometimes hard. Always be sure to believe in what you've accomplished and your ability to continue to persevere. Sometimes, the going gets tough. Sometimes, we have to work harder than we thought we would have to. Sometimes, we don't learn things as quickly as we would like (or at least our schedule would like.) It's okay to admit something is difficult and it's also okay to step away from it and tackle it again tomorrow. We must forgive ourselves for not being superheroes and start embracing our abilities for what they are, and use them to our advantage. Mix the ingredients above with the most important ingredient: your Appreciation for music and your ability to make it. This is really why you started to study music, right? Because you LOVE it! Be sure to always maintain your appreciation for music and your ability to play it, create it, understand it, and speak it! Always remember why you started studying music in the first place. As a listener, continue to listen, learn from, and enjoy the music of others, and as a musician, always appreciate and respect your awesome ability to greatly contribute to music! Well, this recipe sure is scrumptious and it will definitely prepare you for a successful practice session. Add your own ingredients to make your practice sessions what you want it to be! Want to post some of your own "No Bake but Sounds Great" Practice ingredients? Please share your thoughts in the comments section below! I am very blessed to have some very hard working students. There are times, however, when students fall into a sticky-stucky, icky-yucky pit full of excuses as to why they just can't practice (it happens to the best of us.) I've discovered a resolution that might blow your minds, but will certainly help your students blow you away! Give your student MORE music! That's right, I said it, and I do it, and it works. This Ultimate Practice Incentive might surprise you. It might even have you rolling your eyes, scratching your head, or saying things like, "Is this teacher CRAZY?!" While the latter might be slightly true, this has proven to be a successful way to unstick my stuck students and give them a positive and educational practice incentive that parents, students, and teachers are happy about. Set a goal for your students, either weekly, monthly, or quarterly (whatever works for you). Goals should be attainable. Make sure each student has goals that work for them. For example, one student might be able to do 400 minutes a month or more, while another might only be able to do 300 or less. Get into a routine of having them or their parents log their practice minutes The practice log should be checked by the teacher on a weekly basis. Give them sticker rewards for reaching a fair number of minutes per week. After your students have gotten into a logging routine introduce the Ultimate Practice Incentive. Offer musical prizes in the form of, you guessed it! MUSIC! Make sure the music is fun and engaging. Themed music works well. Also, students love being creative so you can take this opportunity to compose a song as one of your musical prizes. You'll have your students out of that icky-yucky pit in no time! So, give it and try and let me know what you think of this idea or if you have any other Ultimate Practice Incentive ideas. Being a piano teacher is a wonderful gift. I get to share my love of music with others (oh, and I actually happen to know a lot about it too!) 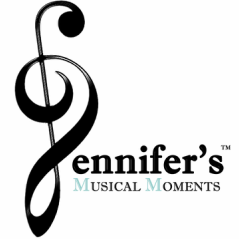 Jennifer's Musical Moments offers in-studio (at my place) and in-home (at your place) piano lessons. That means, in essence, I have two studios. One studio being my place of business, and my other studio being my "Pianist. Will Play for Chocolate" tote bag. So, while being a piano teacher is a blessing, being a traveling piano teacher can sometimes leave me scrounging for new and inventive ways to teach a concept using (sometimes unconventional) household items. Here is a glimpse into some of my more recent, on the spot, tools I've used to teach. I needed one of my students to play an entire piece of music without looking at his hands. He looked like a bobble head bouncing his head and eyes up and down to check the notes, then check his fingers on the key. I then had an "ah-ha" moment. The "Napkin Song" was born. Napkins are perfect for covering fingers and hands. They are lightweight and they gracefully lay on the hand. Anytime we need to work on building trust in our eye to hand coordination, the "Napkin Song" works wonders! I used this fun activity to show rests (beats of silence) in the music. Rests can sometimes (actually all the time) be challenging for students to do. Some students simply skip over them as if they don't exist. One of my students was having difficulty feeling the rests in her song so I immediately came up with an idea. I needed a percussion instrument (besides the piano), however, there was none, so I found the nearest ping pong paddle and ball and created my own instrument! I told her every time you have a rest in your music, I will bounce the ping pong ball off of the paddle. If we don't hear the bounce, that means you were playing and you skipped your rest. After lots of laughs, and us changing roles as piano player/ping pong player, we successfully accomplished an understanding of the rests in the song, all while making some pretty fun sounding music! The iPad is a common tool for piano teachers to use in teaching students. I really wanted to incorporate more ear training into my students piano lessons. I decided to use the family iPad to record excerpts of pieces for the students to transcribe by ear. The students LOVE this activity. It's great because they can work on developing their aural skills, not just in the lesson, but throughout the entire week, and once they've accomplished the task of actually deciphering music without written notes, they show their excitement by smiling ear to ear and asking for another tune to tackle. You can also use the iPad for other fun things like recording the teachers duet of a song for students to practice along, or simply just capturing successful musical moments with your students. Trust me, they will cherish these musical memories! Finding time to practice piano can be a bit, well, challenging. Yes, we love music. Yes, after every lesson we have this yearning to go home and practice the OMGeezies out of a song until we feel as though we've become DiCaprio screaming with open arms on the top of that forsaken boat (Parents, you might have to explain this reference to your children). Then, reality sets in and we realize that we are mere mortals, going to school 8-3 or working our jobs 9-5. As children, our schedules have schedules (whatever that means). We resort to scheduling in "fun" like play dates or computer time. As adults, we work all day, then we come home to our families, and as much as we love them dearly, we work some more until the entire family crashes, probably at some undesirable time (7pm or 2am), and wakes up the next morning to do it all again. We are all very busy and our lives are all very full, but I believe that if you are taking lessons, there is a musical kind of hunger inside your soul that deserves to be fed, and just like you schedule in time for feeding your body (daydreaming about Nutella on Oatnut bread right about now), why not make it a point to schedule in time to feed your soul. I am a professed scheduler; appointment books, dry erase boards, post its, calendars, and even text messages to myself. I do it all. When I have something written down, it automatically makes it important. This is why I encourage all my students to make practicing piano a routine. When something becomes routine, you EXPECT it to be happening. You expect that you will eat breakfast in the morning (or at least lunch in the afternoon). You expect you will brush your teeth afterwards. You expect to have soccer practice after school. You expect that your favorite television show will be on Wednesday at 8pm. As a piano teacher, I know my students expect to progress at learning piano (I also have that expectation for them). So if you expect to progress, then you should absolutely expect to be practicing. Pick a time, a time you know you can commit to, and as mega brand Nike says, "Just Do It." I guarantee that you will certainly begin to feel as though you are "DiCaprio-ing" your way to the top of that ship. Only difference is that after you've committed your time and you are making your musical strides, it will be smooth sailing. I am a teacher, performer, and music transcriber. I am a novice blogger, sharing my thoughts for students, parents, and pretty much anyone who will read. I hope you enjoy!